So, we are learning a little bit differently than the other dogs. 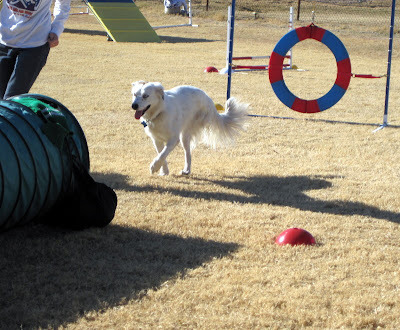 While the instructor holds the leashes and the owners get their pups all riled up before going in the tunnel, I am putting Mo in a stay at the tunnel's edge and then crawling halfway through the other end til I can grab her leash and pull her through. This is how we are working all obstacles. But, she's slowly figuring it out. What she hates the first week, she'll do without complaint the next week. She's just got to take a week to think through it wasn't really all that bad. I take her to Jim's when I take Frankie to practice. 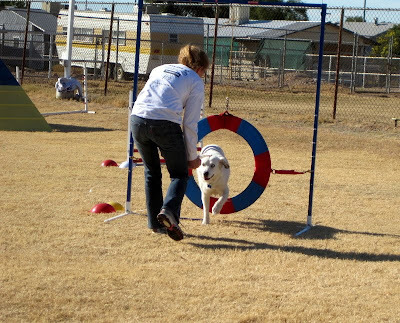 And there, with no pressure of class, she LOVES agility. 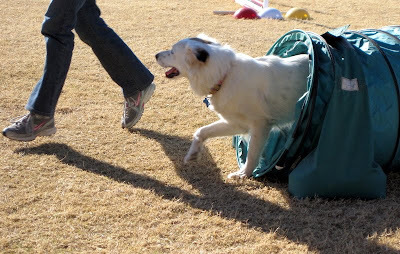 Look at this happy dog: She loves the tunnels now. She'll happily follow me all over the course. One day after we practiced, I let her and Frankie run loose for a while, just to see what would happen. And...I couldn't believe it....MO PLAYED! Frankie wanted to play so badly, he kept play-bowing to her and than taking off running. Eventually she play-bowed back and chased him. So cute!! She even chased him through the tunnels! I have to admit, cuz I'm a softie, that it made me tear up a little bit. 7 weeks later, she still hates class. When we get there, she sits as far away from the car door as possible and I have to literally drag her out of the car. (Mo: I'm not going. You can't make me.) But once we get started, she enjoys all the treats. Occasionally she still becomes invisible, but not as often. Next week, we start taking classes with Jim. Hopefully she'll take to that better since she is already familiar with his yard and equipment. Wish us luck!